This is Issue One of Comics Squee. Each month our panelists, bitten by radioactive spiders, squee about comic books, graphic novels, and general sequential art geekery. I’m your host, Chriss Cornish. Joining me are regular squeesters John Oliver, April Taie and, taking the revolving 4th chair this issue, is Dan Whitwork, who has written for Access and Midnight Graffitti. Who’s interviewed such interesting people as Jackie Chan and Quentin Tarantino. This issue of Comics Squee we’ve got Canadian hit Superhero Girl, a comic book holiday, a Dr. Strange/Spider-Man teamup by Steve Ditko, and a silly graphic novel series for very small people. We rolled a ten-sided die to see who goes first and Chriss won(?) so she’s first up. This is an international holiday, every August 28, to go out and be seen reading comic books in public. Read Comics in Public day started back in 2010 when Brian Heater, of the Daily Crosshatch, realized that he was self conscious about being seen reading comic books on the subway ride to work. Even though he writes about comics for a living. When he told a coworker she said they ought start a holiday to celebrate comic book reading pride. So RCPD was born. 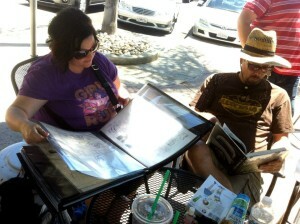 Chriss schedules a San Diego celebration of RCPD each year where people bring stacks of comics and graphic novels to share. 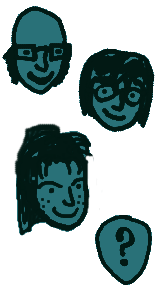 There’s lots of reading comics, talking about comics, showing off sketches, talking about comics, etc. Read Comics in Public Day is held on August 28 each year, which is comics legend Jack “The King” Kirby’s birthday. 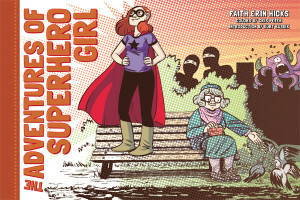 John discovered Superhero Girl via I09 when it was running as a webcomic. Darkhorse has published a lovely hardcover collection of the strips, which have been colored very nicely. It’s sweet and charming and fun as Superhero girl seeks out her nemesis, deals with ninja attacks, trains her cat in the ways of superheroing, meets her doppelganger, and finds out who she is as a superhero. Incidentally, Superhero Girl’s cat reminded Dan that the Super Man family had a super cat named Streaky. Leading us to wonder if this was a reference to its super power of getting hair all over their uniforms, and if it had super cat hair ball spitting powers. Sadly, our trusty pants-computers didn’t provide answers for either of these last two questions. This is a mostly all-ages graphic novel series about a little girl who gets possessed by a pit demon and becomes Gurgazon the Unclean, the cuddliest little pit demon ever trapped in the Llewellyn-Vane House for Captured Spirits and Ghostly Curiosities. Her fellow members of this supernatural collection are a haunted jukebox and Headless Marie Antoinette. Gurgazon will not conform to your societal norms!!!! 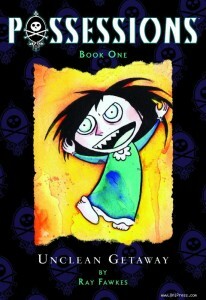 Possessions is fun and the cartoon art style, black + one color, is good and easy to follow. This Spider-Man annual from the ’60s is Dan’s favorite comic ever. There are two great stories by comics legend Steve Ditko. The fist is a Doctor Strange / Spider-Man teamup story, the first time Strange and Spider-Man meet in the Marvel universe. Steve Ditko also gets a much deserved writing credit, though it was accompanied by a passive-aggressive caption note from Stan Lee. It’s the action packed Doctor Strange / Spider-Man teamup team-up tale that makes this Dan’s favorite comic. Steve Ditko is at his best. It’s a slow day for Spidey when he sees goons trying to knock over Strange’s place for a wicked wizard after the half of the Wand of Watoom in the good doctor’s possession. The other Ditko story in this Annual features Dr. Doom buying in to J. Jonah Jameson’s anti-Spidey propaganda and deciding that teaming up with the Spider-menace is just the ticket for defeating Cursed Richards. Things get even more fun when Flash Tompson decides to dress as Spider-Man to frighten Peter Parker and gets kidnapped by Doom as the real Spidey. Hilarity ensues. A consultation of the pants-computer indicates that a reading copy of this ’60s gem will set you back between $5-$40 depending on condition. And let’s face it, comics are meant to be read. If you slab a comic all you’ve got is a poster. Correction Update: We had a factual flaw in our ramblings in this segment. Stan Goldberg was not Marvel’s production manager in the mid-’60s. That would have been Sol Brodsky. Sorry, Sol, wherever you are. What Are We Looking Forward to Reading Next? NO, this won’t be what we squee about next issue of Comics Squee. It’s just a quick look at what comics and graphic novels are next on our to-read list. Chriss: The next issue in Katie Cook and Andy Price’s run on My Little Pony: Friendship is Magic. The current story focuses on Big Mac and it’s been a fun first issue, full of the nod-and-a-wink references that fans have come to love and expect from their MLP run. April: March by Congressman Congressman John Lewis, who was a colleague of Martin Luther King Jr. and is widely known for his role in the Civil Rights Movement. It should be released soon by Top Shelf. Dan: The next issue of FF (Future Foundation, not Fantastic Four). The Fantastic Four have gone off on a space-time vacation and left a specially picked team to watch the kids of the Future Foundation while they’re away; She-Hulk, Scot Lang (the second Ant Man), Medusa of the Inhumans, and a pop singer in a Thing suit. It’s fun and silly, unlike the rest of the grim let’s-be-serious-like-the-movies Marvel titles. John: The next volume of Fatale by Ed Brubaker and Sean Phillips. Which got a big thumbs-up from the rest of the panel. This occult thriller is set across different time periods.